Andrew is the Co-Owner of First Aid Training Centre. Andrew is ever evolving, and learning. 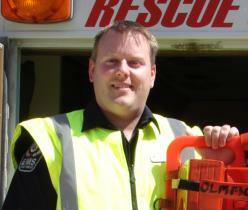 Andrew is currently a licensed EMT for the Province of Manitoba. He started training in the year 2000, and has since had his wife Paula join him on the training side and EMS side. He wishes to share his knowledge and expertise to all Manitobans by running premium run courses at rates for all budgets. Below are Andrew's current set of qualifications.